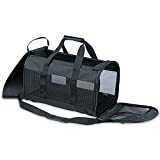 Top 12 Best Pro Pet Supplies Dog Carrier Options! Home All Things Dogs Top 12 Best Pro Pet Supplies Dog Carrier Options! Traveling with your dog can be a hassle, especially when you don’t have the proper tools for the job. Dog carriers come in a variety of shapes and sizes, so it can be difficult trying to figure out which carrier is right for you. Here at Pro Pet Supplies, we’re dog carrier experts. Read this post for a guide on how to choose the best dog carrier, and learn a few tips on the best ways to travel with your dog. We love our dogs so much, why would we want to leave them behind? Traveling with your dog can be a great bonding experience, especially if done right. Here are a few tips that will help keep you and your dog happy during long trips. When a dog is in a travel carrier, they don’t have very much room to run around. A dog that has too much energy will likely not want to lie in a carrier for extended periods of time. An overly energized pup will have a harder time sitting still, and may cause trouble during the trip. Before making your dog settle down in a travel carrier, we recommend that you expel their excess energy through exercise. This can be anything from a long walk to extended playtime with their favorite toy. This will help keep your dog calm throughout the trip. If you haven’t traveled with your dog before, it’s a good idea to take them on a test drive before your big travel day. We recommend that you take your dog on 2-4 hour mini road trips to gauge how they will react during longer travel times. If your dog is unable to handle a short trip, this may be an indication that travel will stress them out. Talk to your vet about alternative travel methods to help keep your dog calm on long trips. Before hitting the road, it’s a good idea to get your dog checked out at a local veterinarian clinic. This will help ensure that your dog is in peak condition and ready to travel. This can be particularly important should your dog need any special medication or treatment throughout your travels. You can also contact your vet about the best methods for traveling with your dogs, and ask for any recommendations or insights they might have. Your dog has no idea it’s going to be traveling, so it certainly can’t pack for itself. When traveling with your dog, pack his or her own little bag with all the essentials. This includes food, medication, collar with ID, leashes, blankets, beds, toys, and potty pads. To make sure you have everything you need, we recommend writing out a complete doggie packing list that you can check off. This will help ensure you have everything you need for a successful trip with your dog. There are a few factors that dog owners should consider when looking to purchase a carrier. When purchasing a dog carrier, make sure that the size of the carrier is relative to the size of your dog. Small dogs may feel uncomfortable in large carriers, while larger dogs can feel claustrophobic in smaller carriers. A good pet carrier is made of strong materials that won’t fall apart in the middle of your trip. Ease of Transport. Carriers are for transportation, so they obviously need to be highly portable. The best dog carriers have features that help with transportation, including wheels and study handles. When traveling with a dog, safety is a huge concern. A good travel carrier will be designed with safety features that will help keep your dog secure during your trip. If you’re taking a long trip, you’ll want to make sure your pup can get comfortable. Carriers should be spacious and well padded for maximum coziness throughout the ride. Smaller dogs need smaller space so they can feel cozy and secure. Here are some of our best carriers for little dogs. High-end Oxford Cloth- Wear-resistant and bite-resistant, provide solid and durable use experience. Breathable Mesh Grid- Allow air flow without stuffiness, offer maximum comfort and high visibility for your pet. All-round Protection- Restrain your pet in settled place without free movement, extremely adds extra protection and security. Multi-functional Pockets- With various pockets on the bag, convenient for you to keep and store your pet's daily supplies. Easy to Carry around- One zipper to unfold and fold the bag, quite delicate and practical. This sleek and stylish carrier is the perfect travel accessory for you and your dog. The carrier is made from with a durable Neo-Tec sports fabric. This fabric is incredibly lightweight and creates a comfortable interior. The mesh panels allow for improved ventilation and allow you to keep a close eye on your dog. The Ethical Dog Travel Gear CarryAll has a dimension of 13”x8” and can carry a dog up to 8 lbs. The shoulder strap is adjustable and extremely durable, so you don’t have to worry about it breaking off. The Soft Side Kennel Cab is perfect for taking your small dog on big adventures. 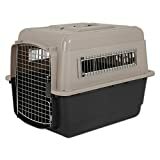 It has a two-door design that allows you to place your pet in the carrier from the front or top of the carrier. There is also a rear pocket that allows you to stash any essentials for the trip. This carrier has an interior dimension of 17”x10”x10”, and can handle dogs up to 15 lbs. There is a durable carrying handle, as well as a shoulder strap for easy transport. 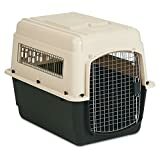 Sturdier than their Soft Side Kennel Cab, the Petmate Two Door Top Load Dog Kennel is a great option for longer trips. It has a wide entrance with a squeeze handle opening mechanism that is sure to keep your dog safely inside. There’s also a large top-loading door that makes it easier to gently lift your dog in and out of the carrier. This carrier has a larger interior with dimensions at 19.4”x12.8x10”, making it just the right size for a cozy trip. It can comfortably carry dogs up to 10 lbs. There are plenty of great carrier options for medium sized dogs. Here are some of the best ones we have to offer. This mid-sized dog carrier is an ideal choice for both travel and housetraining. It is built from incredibly durable materials that will get your dog to your destination safely. The front-loading door has a squeeze latch that is easy to open for humans, not for dogs. The medium sized Vari Kennel Pet Carrier can hold pets up to 30 pounds, and can come in a variety of sizes based on your dog’s size. This innovative carrier is designed to be durable and secure, so your pup will be safe throughout your travel experience. This kennel has a 2-way door that opens on either side, giving your dog more than enough room to enter and exit. It also has upper and lower ventilation holes to provide better airflow and visibility. The heavy-duty construction of the Fashion Compass Kennel can carry dogs up to 20 lbs without cracking or warping. The sliding top and bottom sections are easy to assemble, and make cleaning quick and convenient. The Aspen Pet Traditional Plastic Kennel utilizes a tried-and-true design that has helped owners travel with their pets for decades. It is made from 95% recycled plastic that is both lightweight and highly durable. The ventilation holes reach up both sides, keeping the interior of the carrier cool at all times. The Aspen Pet Traditional Plastic Kennel can comfortable fit dogs up to 20” in length, and can hold between 10-15 lbs. Large dogs need more room to travel comfortably, so it’s best to get a carrier that can handle their size. Here are some of the largest dog carrier options we have in stock. 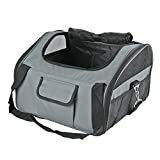 Similar to the smaller Fashion Compass Kennel we mentioned before, this carrier is a perfect option for dogs that are a bit larger. The Fashion Compass Kennel has a 2-way door that opens on both sides, so it’s easier to coax your pet in and out during travel. The upper and lower ventilation provides better airflow, and allows you to check in on your dog at any time. There are no tools needed to assemble the Fashion Compass Kennel with their unique slide and snap assembly and four bolt design. When properly assembled, this carrier can safely hold dogs up to 90 lbs. 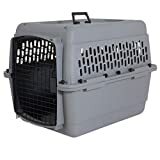 This large pet crate is an affordable option for those who are traveling with big dogs. 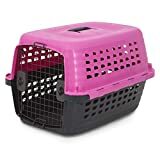 The Large Vari Kennel Pet Carrier is very similar to the smaller sized options, featuring the same durable construction, easy-open squeeze latch, and side ventilation holes. The Large Vari Kennel Pet Carrier has dimensions of 40”x27”x30”, and is strong enough to transport dogs at a weight range of 70-90 lbs. Although the Ultra Vari Kennel is very large, it has all the makings of a perfect travel carrier. This carrier meets most air travel requirements, and is designed with a variety of features to keep your dog secure. This includes several tie-down strap holes that allow for zip-tie installation. This giant carrier has wide dimensions of 40”x27”x30”, and can carry dogs between 90-125 lbs. With a heavy-duty plastic shell and metal screws, this carrier is sure to keep your dog safe throughout your trip. Long trips can be difficult on your dog, especially if they feel cramped or uncomfortable. Below we listed three of the most comfortable carriers best suited for extended expeditions. The Portable Pet Home is the epitome of comfort when it comes to traveling with your dog. Rather than being labeled as a carrier, this product provides all the comforts of home in a portable package. 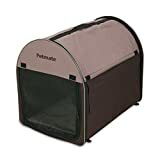 Made with a heavy-duty and water resistant fabric and climate control window covers, the Portable Pet Home can be taken just about anywhere. 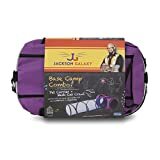 This carrier has a large foam pad bed that provides maximum comfort, which is great for long trips. This carrier is large enough to hold any small or medium sized dog. 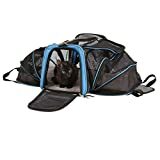 The unique design of the Petmate See and Extend Pet Carrier makes it one of the best travel carriers on our list. The innovative zip-out plastic-coated mesh allows you to extend the space inside the carrier, so your pup will have more room to lay out. The mesh is durable and lightweight, and allows you to check on your dog with a simple glance. The shoulder and hand straps make for easy transport, and are strong enough to hold dogs up to 15 lbs. There is also a removable fleece pad that lines the bottom for increased comfort and stability. The Express Pet Carrier is a comfortable carrier that is built to provide your dog with comfort and security while traveling. It has both top and side zip openings that make it easy to ease your dog in and out of the carrier. The top opening has a special railroad zipper pull that allows for quick open and close to help keep your dog safe on the road. There are also interior safety tethers that will keep your dog in place throughout the trip. Traveling with your dog can be a rewarding experience, and often leads to a strengthened bond between pet and owner. If you’re looking to bring your dog along on your next road trip, you’ll need to find the right carrier. Carriers should be the right size, made of durable materials, and provide the right amount of comfort. Using our helpful guide, you’re sure to find a dog carrier that checks off all your travel needs. 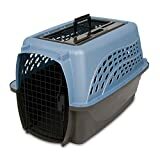 Go Pet Club AB25 Soft Dog Crate, Brown - 25 in.